I don’t think I will have much time to post over here as I just discovered that my inlaws actually expect me to bring foods for their gathering. *sweats* I had told them earlier that I won’t be doing much because my hubby works even on New Year’s eve and I do not want the hassle of fighting with the crowds to buy all the foodstuffs all by myself. I thought they are doing a pot luck party as one of them is having a housewarming. But oh no….my eldest sister-in-law said they thought I am going to get the foods enough for 40 pax. Whatever happened to communication. Yeah…they will get to eat alright. Vegetable dishes and sausage rice (to feed my own kids). Maybe I will need to throw in some farfalle vongole aka butterfly shape pasta fried with chili lala in cans. I don’t know to be proud that they think I am so dependable or be pissed that they think I am doormat superwoman. Never mind, Chinese New Year is only once a year and it was my late mother-in-law who bequeath the ‘authority’ of family gatherings to my hubby who is her youngest son. So, let me see what I can dished up for 40 pax with brocolli, carrots, cauliflower, capsicums and some waxed ducks and sausages. 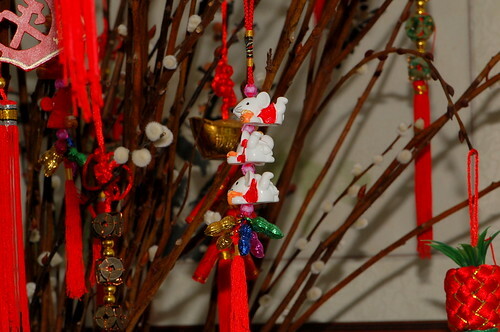 It will be an adventurous Chinese New Year, just like some celebrity chef – reality show to me. Oh ya, did I tell you that I have no plans on what to prepare for the reunion dinner too? Which is officially today! Never mind, for that I have enough pomfrets (tau tay fish) and large prawns in the freezer to pig out on. Hi..lilian..”Keong Hee Huat Chai” to you and family….happy cooking and feasting..
Wahh… wat a challenging task! My mum’s side reunion dinner is always steamboat… so we just throw everything and try to finish it. Good luck Lilian, for the dinner preparation and happy chinese new year! Keong hee huat chai to you and your family!! i kinda miss the busy crazy rush in the kitchen etc etc since my family hardly cook anymore. going for a buffet reunion dinner tonite and it feels different la….must take up cooking from all your fantastic recipes and try cooking CNY dinner next year! !